124:0.1 ALTHOUGH JESUS might have enjoyed a better opportunity for schooling at Alexandria than in Galilee, he could not have had such a splendid environment for working out his own life problems with a minimum of educational guidance, at the same time enjoying the great advantage of constantly contacting with such a large number of all classes of men and women hailing from every part of the civilized world. 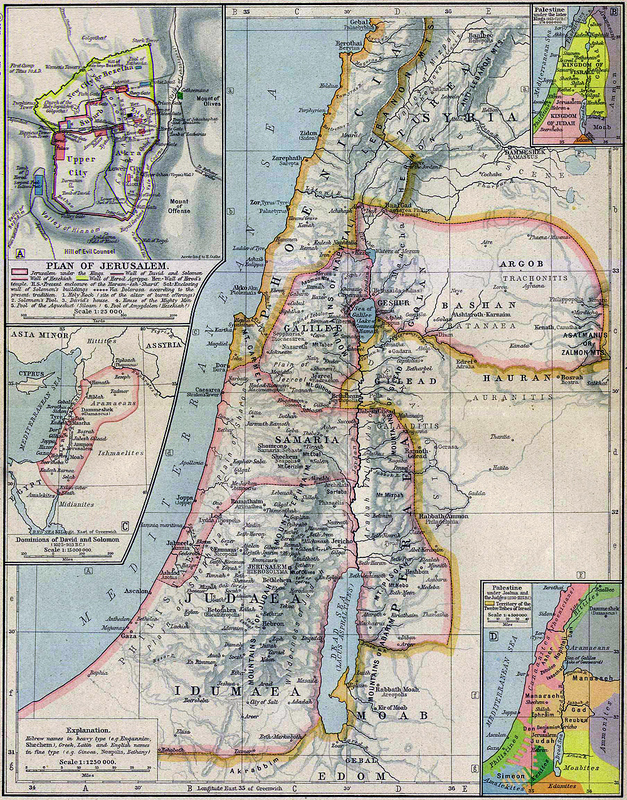 Had he remained at Alexandria, his education would have been directed by Jews and along exclusively Jewish lines. 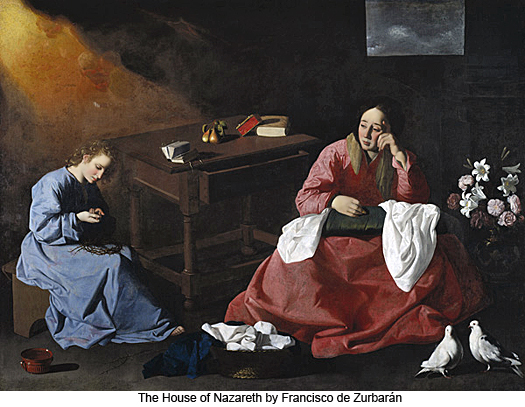 At Nazareth he secured an education and received a training which more acceptably prepared him to understand the gentiles, and which gave him a better and more balanced idea of the relative merits of the Eastern, or Babylonian and the Western, or Hellenic, views of Hebrew theology. 124:1.1 Though it could hardly be said that Jesus was ever seriously ill, he did have some of the minor ailments of childhood this year, along with his brothers and baby sister. 124:1.2 School went on and he was still a favored pupil, having one week each month at liberty, and he continued to divide his time about equally between trips to neighboring cities with his father, sojourns on his uncle’s farm south of Nazareth, and fishing excursions out from Magdala. 124:1.3 The most serious trouble as yet to come up at school occurred in late winter when Jesus dared to challenge the chazan regarding the teaching that all images, pictures, and drawings were idolatrous in nature. Jesus delighted in drawing landscapes as well as in modeling a great variety of objects in potter’s clay. Everything of that sort was strictly forbidden by Jewish law, but up to this time he had managed to disarm his parents’ objection to such an extent that they had permitted him to continue in these activities. 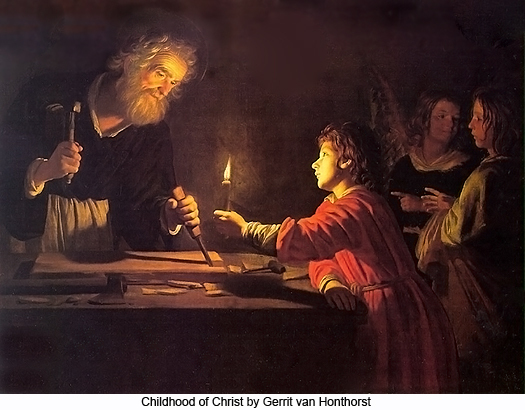 124:1.4 But trouble was again stirred up at school when one of the more backward pupils discovered Jesus drawing a charcoal picture of the teacher on the floor of the schoolroom. There it was, plain as day, and many of the elders had viewed it before the committee went to call on Joseph to demand that something be done to suppress the lawlessness of his eldest son. And though this was not the first time complaints had come to Joseph and Mary about the doings of their versatile and aggressive child, this was the most serious of all the accusations which had thus far been lodged against him. Jesus listened to the indictment of his artistic efforts for some time, being seated on a large stone just outside the back door. He resented their blaming his father for his alleged misdeeds; so in he marched, fearlessly confronting his accusers. The elders were thrown into confusion. Some were inclined to view the episode humorously, while one or two seemed to think the boy was sacrilegious if not blasphemous. Joseph was nonplused, Mary indignant, but Jesus insisted on being heard. He had his say, courageously defended his viewpoint, and with consummate self-control announced that he would abide by the decision of his father in this as in all other matters controversial. And the committee of elders departed in silence. 124:1.5 Mary endeavored to influence Joseph to permit Jesus to model in clay at home, provided he promised not to carry on any of these questionable activities at school, but Joseph felt impelled to rule that the rabbinical interpretation of the second commandment should prevail. And so Jesus no more drew or modeled the likeness of anything from that day as long as he lived in his father’s house. But he was unconvinced of the wrong of what he had done, and to give up such a favorite pastime constituted one of the great trials of his young life. 124:1.6 In the latter part of June, Jesus, in company with his father, first climbed to the summit of Mount Tabor. It was a clear day and the view was superb. It seemed to this nine-year-old lad that he had really gazed upon the entire world excepting India, Africa, and Rome. 124:1.7 Jesus’ second sister, Martha, was born Thursday night, September 13. Three weeks after the coming of Martha, Joseph, who was home for awhile, started the building of an addition to their house, a combined workshop and bedroom. A small workbench was built for Jesus, and for the first time he possessed tools of his own. At odd times for many years he worked at this bench and became highly expert in the making of yokes. 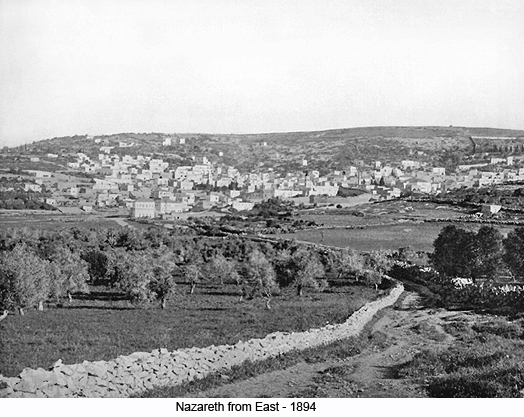 124:1.8 This winter and the next were the coldest in Nazareth for many decades. Jesus had seen snow on the mountains, and several times it had fallen in Nazareth, remaining on the ground only a short time; but not until this winter had he seen ice. The fact that water could be had as a solid, a liquid, and a vapor—he had long pondered over the escaping steam from the boiling pots— caused the lad to think a great deal about the physical world and its constitution; and yet the personality embodied in this growing youth was all this while the actual creator and organizer of all these things throughout a far-flung universe. 124:1.9 The climate of Nazareth was not severe. January was the coldest month, the temperature averaging around 50° F. During July and August, the hottest months, the temperature would vary from 75° to 90° F. From the mountains to the Jordan and the Dead Sea valley the climate of Palestine ranged from the frigid to the torrid. And so, in a way, the Jews were prepared to live in about any and all of the world’s varying climates. 124:1.10 Even during the warmest summer months a cool sea breeze usually blew from the west from 10:00 A.M. until about 10:00 P.M. But every now and then terrific hot winds from the eastern desert would blow across all Palestine. These hot blasts usually came in February and March, near the end of the rainy season. In those days the rain fell in refreshing showers from November to April, but it did not rain steadily. There were only two seasons in Palestine, summer and winter, the dry and rainy seasons. In January the flowers began to bloom, and by the end of April the whole land was one vast flower garden. 124:1.11 In May of this year, on his uncle’s farm, Jesus for the first time helped with the harvest of the grain. Before he was thirteen, he had managed to find out something about practically everything that men and women worked at around Nazareth except metal working, and he spent several months in a smith’s shop when older, after the death of his father. 124:1.13 Jesus continued to grow physically, intellectually, socially, and spiritually. His trips away from home did much to give him a better and more generous understanding of his own family, and by this time even his parents were beginning to learn from him as well as to teach him. Jesus was an original thinker and a skillful teacher, even in his youth. He was in constant collision with the so-called “oral law,” but he always sought to adapt himself to the practices of his family. He got along fairly well with the children of his age, but he often grew discouraged with their slow-acting minds. Before he was ten years old, he had become the leader of a group of seven lads who formed themselves into a society for promoting the acquirements of manhood—physical, intellectual, and religious. Among these boys Jesus succeeded in introducing many new games and various improved methods of physical recreation. 124:2.2 He entered the advanced school of the synagogue in August. At school he was constantly creating trouble by the questions he persisted in asking. Increasingly he kept all Nazareth in more or less of a hubbub. His parents were loath to forbid his asking these disquieting questions, and his chief teacher was greatly intrigued by the lad’s curiosity, insight, and hunger for knowledge. 124:2.3 Jesus’ playmates saw nothing supernatural in his conduct; in most ways he was altogether like themselves. His interest in study was somewhat above the average but not wholly unusual. He did ask more questions at school than others in his class. 124:2.4 Perhaps his most unusual and outstanding trait was his unwillingness to fight for his rights. Since he was such a well-developed lad for his age, it seemed strange to his playfellows that he was disinclined to defend himself even from injustice or when subjected to personal abuse. As it happened, he did not suffer much on account of this trait because of the friendship of Jacob, a neighbor boy, who was one year older. He was the son of the stone mason, a business associate of Joseph. Jacob was a great admirer of Jesus and made it his business to see that no one was permitted to impose upon Jesus because of his aversion to physical combat. Several times older and uncouth youths attacked Jesus, relying upon his reputed docility, but they always suffered swift and certain retribution at the hands of his self-appointed champion and ever-ready defender, Jacob the stone mason’s son. 124:2.10 When on his first trip with his father to observe the fishing industry on the lake of Galilee, Jesus had just about made up his mind to become a fisherman; but close association with his father’s vocation later on influenced him to become a carpenter, while still later a combination of influences led him to the final choice of becoming a religious teacher of a new order. 124:3.1 Throughout this year the lad continued to make trips away from home with his father, but he also frequently visited his uncle’s farm and occasionally went over to Magdala to engage in fishing with the uncle who made his headquarters near that city. 124:3.2 Joseph and Mary were often tempted to show some special favoritism for Jesus or otherwise to betray their knowledge that he was a child of promise, a son of destiny. But both of his parents were extraordinarily wise and sagacious in all these matters. The few times they did in any manner exhibit any preference for him, even in the slightest degree, the lad was quick to refuse all such special consideration. 124:3.3 Jesus spent considerable time at the caravan supply shop, and by conversing with the travelers from all parts of the world, he acquired a store of information about international affairs that was amazing, considering his age. This was the last year in which he enjoyed much free play and youthful joyousness. From this time on difficulties and responsibilities rapidly multiplied in the life of this youth. 124:3.4 On Wednesday evening, June 24, A.D. 5, Jude was born. Complications attended the birth of this, the seventh child. Mary was so very ill for several weeks that Joseph remained at home. Jesus was very much occupied with errands for his father and with many duties occasioned by his mother’s serious illness. Never again did this youth find it possible to return to the childlike attitude of his earlier years. From the time of his mother’s illness—just before he was eleven years old—he was compelled to assume the responsibilities of the first-born son and to do all this one or two full years before these burdens should normally have fallen on his shoulders. 124:3.5 The chazan spent one evening each week with Jesus, helping him to master the Hebrew scriptures. He was greatly interested in the progress of his promising pupil; therefore was he willing to assist him in many ways. 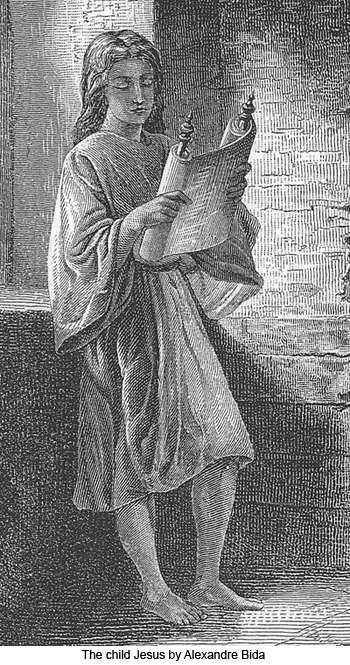 This Jewish pedagogue exerted a great influence upon this growing mind, but he was never able to comprehend why Jesus was so indifferent to all his suggestions regarding the prospects of going to Jerusalem to continue his education under the learned rabbis. 124:3.6 About the middle of May the lad accompanied his father on a business trip to Scythopolis, the chief Greek city of the Decapolis, the ancient Hebrew city of Beth-shean. On the way Joseph recounted much of the olden history of King Saul, the Philistines, and the subsequent events of Israel’s turbulent history. Jesus was tremendously impressed with the clean appearance and well-ordered arrangement of this so-called heathen city. He marveled at the open-air theater and admired the beautiful marble temple dedicated to the worship of the “heathen” gods. Joseph was much perturbed by the lad’s enthusiasm and sought to counteract these favorable impressions by extolling the beauty and grandeur of the Jewish temple at Jerusalem. Jesus had often gazed curiously upon this magnificent Greek city from the hill of Nazareth and had many times inquired about its extensive public works and ornate buildings, but his father had always sought to avoid answering these questions. Now they were face to face with the beauties of this gentile city, and Joseph could not gracefully ignore Jesus’ inquiries. 124:3.7 It so happened that just at this time the annual competitive games and public demonstrations of physical prowess between the Greek cities of the Decapolis were in progress at the Scythopolis amphitheater, and Jesus was insistent that his father take him to see the games, and he was so insistent that Joseph hesitated to deny him. The boy was thrilled with the games and entered most heartily into the spirit of the demonstrations of physical development and athletic skill. Joseph was inexpressibly shocked to observe his son’s enthusiasm as he beheld these exhibitions of “heathen” vaingloriousness. After the games were finished, Joseph received the surprise of his life when he heard Jesus express his approval of them and suggest that it would be good for the young men of Nazareth if they could be thus benefited by wholesome outdoor physical activities. Joseph talked earnestly and long with Jesus concerning the evil nature of such practices, but he well knew that the lad was unconvinced. 124:3.8 The only time Jesus ever saw his father angry with him was that night in their room at the inn when, in the course of their discussions, the boy so far forgot the trends of Jewish thought as to suggest that they go back home and work for the building of an amphitheater at Nazareth. 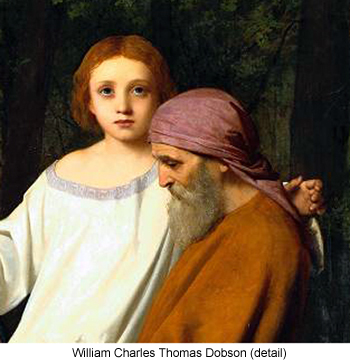 When Joseph heard his first-born son express such un-Jewish sentiments, he forgot his usual calm demeanor and, seizing Jesus by the shoulder, angrily exclaimed, “My son, never again let me hear you give utterance to such an evil thought as long as you live.” Jesus was startled by his father’s display of emotion; he had never before been made to feel the personal sting of his father’s indignation and was astonished and shocked beyond expression. 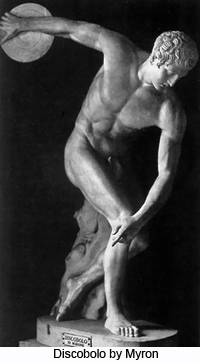 He only replied, “Very well, my father, it shall be so.” And never again did the boy even in the slightest manner allude to the games and other athletic activities of the Greeks as long as his father lived. 124:3.9 Later on, Jesus saw the Greek amphitheater at Jerusalem and learned how hateful such things were from the Jewish point of view. Nevertheless, throughout his life he endeavored to introduce the idea of wholesome recreation into his personal plans and, as far as Jewish practice would permit, into the later program of regular activities for his twelve apostles. 124:3.10 At the end of this eleventh year Jesus was a vigorous, well-developed, moderately humorous, and fairly lighthearted youth, but from this year on he was more and more given to peculiar seasons of profound meditation and serious contemplation. He was much given to thinking about how he was to carry out his obligations to his family and at the same time be obedient to the call of his mission to the world; already he had conceived that his ministry was not to be limited to the betterment of the Jewish people. 124:4.1 This was an eventful year in Jesus’ life. He continued to make progress at school and was indefatigable in his study of nature, while increasingly he prosecuted his study of the methods whereby men make a living. He began doing regular work in the home carpenter shop and was permitted to manage his own earnings, a very unusual arrangement to obtain in a Jewish family. This year he also learned the wisdom of keeping such matters a secret in the family. He was becoming conscious of the way in which he had caused trouble in the village, and henceforth he became increasingly discreet in concealing everything which might cause him to be regarded as different from his fellows. 124:4.2 Throughout this year he experienced many seasons of uncertainty, if not actual doubt, regarding the nature of his mission. His naturally developing human mind did not yet fully grasp the reality of his dual nature. The fact that he had a single personality rendered it difficult for his consciousness to recognize the double origin of those factors which composed the nature associated with that selfsame personality. 124:4.3 From this time on he became more successful in getting along with his brothers and sisters. He was increasingly tactful, always compassionate and considerate of their welfare and happiness, and enjoyed good relations with them up to the beginning of his public ministry. To be more explicit: He got along with James, Miriam, and the two younger (as yet unborn) children, Amos and Ruth, most excellently. He always got along with Martha fairly well. What trouble he had at home largely arose out of friction with Joseph and Jude, particularly the latter. 124:4.4 It was a trying experience for Joseph and Mary to undertake the rearing of this unprecedented combination of divinity and humanity, and they deserve great credit for so faithfully and successfully discharging their parental responsibilities. Increasingly Jesus’ parents realized that there was something superhuman resident within this eldest son, but they never even faintly dreamed that this son of promise was indeed and in truth the actual creator of this local universe of things and beings. Joseph and Mary lived and died without ever learning that their son Jesus really was the Universe Creator incarnate in mortal flesh. 124:4.5 This year Jesus paid more attention than ever to music, and he continued to teach the home school for his brothers and sisters. It was at about this time that the lad became keenly conscious of the difference between the viewpoints of Joseph and Mary regarding the nature of his mission. He pondered much over his parents’ differing opinions, often hearing their discussions when they thought he was sound asleep. More and more he inclined to the view of his father, so that his mother was destined to be hurt by the realization that her son was gradually rejecting her guidance in matters having to do with his life career. And, as the years passed, this breach of understanding widened. Less and less did Mary comprehend the significance of Jesus’ mission, and increasingly was this good mother hurt by the failure of her favorite son to fulfill her fond expectations. 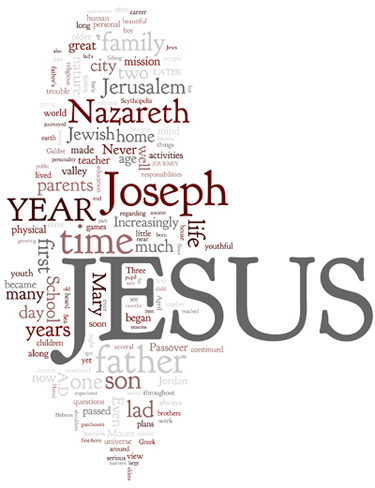 124:4.6 Joseph entertained a growing belief in the spiritual nature of Jesus’ mission. And but for other and more important reasons it does seem unfortunate that he could not have lived to see the fulfillment of his concept of Jesus’ bestowal on earth. 124:4.7 During his last year at school, when he was twelve years old, Jesus remonstrated with his father about the Jewish custom of touching the bit of parchment nailed upon the doorpost each time on going into, or coming out of, the house and then kissing the finger that touched the parchment. As a part of this ritual it was customary to say, “The Lord shall preserve our going out and our coming in, from this time forth and even forevermore.” Joseph and Mary had repeatedly instructed Jesus as to the reasons for not making images or drawing pictures, explaining that such creations might be used for idolatrous purposes. Though Jesus failed fully to grasp their proscriptions against images and pictures, he possessed a high concept of consistency and therefore pointed out to his father the essentially idolatrous nature of this habitual obeisance to the doorpost parchment. And Joseph removed the parchment after Jesus had thus remonstrated with him. 124:4.8 As time passed, Jesus did much to modify their practice of religious forms, such as the family prayers and other customs. And it was possible to do many such things at Nazareth, for its synagogue was under the influence of a liberal school of rabbis, exemplified by the renowned Nazareth teacher, Jose. 124:4.9 Throughout this and the two following years Jesus suffered great mental distress as the result of his constant effort to adjust his personal views of religious practices and social amenities to the established beliefs of his parents. He was distraught by the conflict between the urge to be loyal to his own convictions and the conscientious admonition of dutiful submission to his parents; his supreme conflict was between two great commands which were uppermost in his youthful mind. The one was: “Be loyal to the dictates of your highest convictions of truth and righteousness.” The other was: “Honor your father and mother, for they have given you life and the nurture thereof.” However, he never shirked the responsibility of making the necessary daily adjustments between these realms of loyalty to one’s personal convictions and duty toward one’s family, and he achieved the satisfaction of effecting an increasingly harmonious blending of personal convictions and family obligations into a masterful concept of group solidarity based upon loyalty, fairness, tolerance, and love. 124:5.1 In this year the lad of Nazareth passed from boyhood to the beginning of young manhood; his voice began to change, and other features of mind and body gave evidence of the oncoming status of manhood. 124:5.2 On Sunday night, January 9, A.D. 7, his baby brother, Amos, was born. Jude was not yet two years of age, and the baby sister, Ruth, was yet to come; so it may be seen that Jesus had a sizable family of small children left to his watchcare when his father met his accidental death the following year. 124:5.3 It was about the middle of February that Jesus became humanly assured that he was destined to perform a mission on earth for the enlightenment of man and the revelation of God. Momentous decisions, coupled with far-reaching plans, were formulating in the mind of this youth, who was, to outward appearances, an average Jewish lad of Nazareth. The intelligent life of all Nebadon looked on with fascination and amazement as all this began to unfold in the thinking and acting of the now adolescent carpenter’s son. 124:5.4 On the first day of the week, March 20, A.D. 7, Jesus graduated from the course of training in the local school connected with the Nazareth synagogue. This was a great day in the life of any ambitious Jewish family, the day when the first-born son was pronounced a “son of the commandment” and the ransomed first-born of the Lord God of Israel, a “child of the Most High” and servant of the Lord of all the earth. 124:5.5 Friday of the week before, Joseph had come over from Sepphoris, where he was in charge of the work on a new public building, to be present on this glad occasion. Jesus’ teacher confidently believed that his alert and diligent pupil was destined to some outstanding career, some distinguished mission. The elders, notwithstanding all their trouble with Jesus’ nonconformist tendencies, were very proud of the lad and had already begun laying plans which would enable him to go to Jerusalem to continue his education in the renowned Hebrew academies. 124:5.6 As Jesus heard these plans discussed from time to time, he became increasingly sure that he would never go to Jerusalem to study with the rabbis. But he little dreamed of the tragedy, so soon to occur, which would insure the abandonment of all such plans by causing him to assume the responsibility for the support and direction of a large family, presently to consist of five brothers and three sisters as well as his mother and himself. 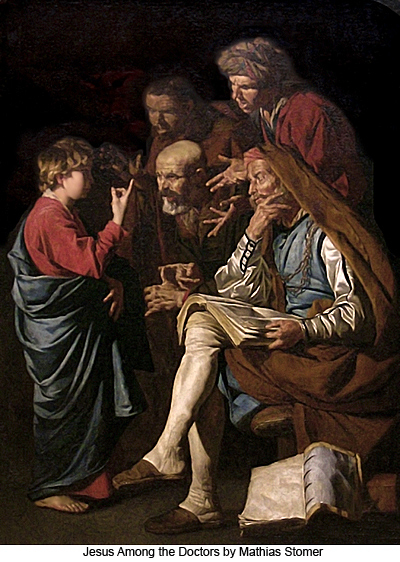 Jesus had a larger and longer experience rearing this family than was accorded to Joseph, his father; and he did measure up to the standard which he subsequently set for himself: to become a wise, patient, understanding, and effective teacher and eldest brother to this family—his family —so suddenly sorrow-stricken and so unexpectedly bereaved. 124:6.1 Jesus, having now reached the threshold of young manhood and having been formally graduated from the synagogue schools, was qualified to proceed to Jerusalem with his parents to participate with them in the celebration of his first Passover. The Passover feast of this year fell on Saturday, April 9, A.D. 7. A considerable company (103) made ready to depart from Nazareth early Monday morning, April 4, for Jerusalem. 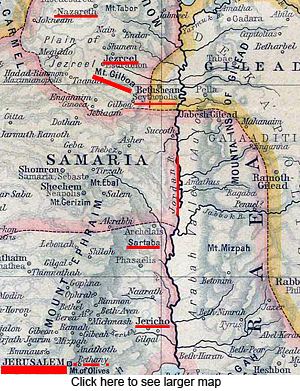 They journeyed south toward Samaria, but on reaching Jezreel, they turned east, going around Mount Gilboa into the Jordan valley in order to avoid passing through Samaria. Joseph and his family would have enjoyed going down through Samaria by way of Jacob’s Well and Bethel, but since the Jews disliked to deal with the Samaritans, they decided to go with their neighbors by way of the Jordan valley. 124:6.3 Before reaching the Jezreel junction, and as they journeyed on, very soon, on the left, they passed the ancient village of Shunem, and Jesus heard again about the most beautiful maiden of all Israel who once lived there and also about the wonderful works Elisha performed there. In passing by Jezreel, Jesus’ parents recounted the doings of Ahab and Jezebel and the exploits of Jehu. In passing around Mount Gilboa, they talked much about Saul, who took his life on the slopes of this mountain, King David, and the associations of this historic spot. 124:6.4 As they rounded the base of Gilboa the pilgrims could see the Greek city of Scythopolis on the right. They gazed upon the marble structures from a distance but went not near the gentile city lest they so defile themselves that they could not participate in the forthcoming solemn and sacred ceremonies of the Passover at Jerusalem. 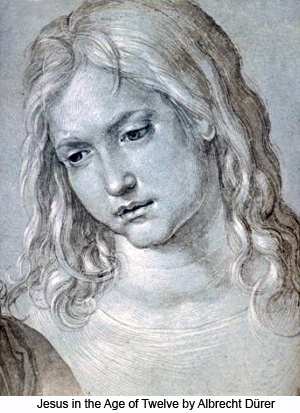 Mary could not understand why neither Joseph nor Jesus would speak of Scythopolis. She did not know about their controversy of the previous year as they had never revealed this episode to her. 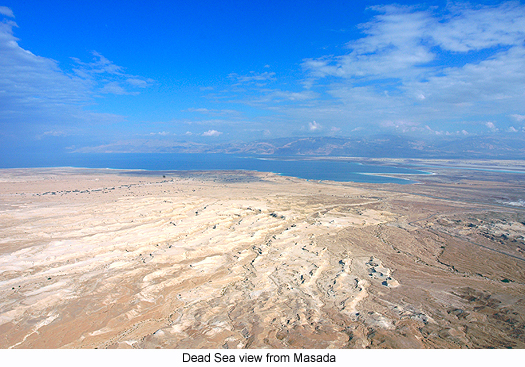 124:6.5 The road now led immediately down into the tropical Jordan valley, and soon Jesus was to have exposed to his wondering gaze the crooked and ever-winding Jordan with its glistening and rippling waters as it flowed down toward the Dead Sea. They laid aside their outer garments as they journeyed south in this tropical valley, enjoying the luxurious fields of grain and the beautiful oleanders laden with their pink blossoms, while massive snow-capped Mount Hermon stood far to the north, in majesty looking down on the historic valley. A little over three hours’ travel from opposite Scythopolis they came upon a bubbling spring, and here they camped for the night, out under the starlit heavens. 124:6.8 By the fourth and last day’s journey the road was a continuous procession of pilgrims. They now began to climb the hills leading up to Jerusalem. As they neared the top, they could look across the Jordan to the mountains beyond and south over the sluggish waters of the Dead Sea. About halfway up to Jerusalem, Jesus gained his first view of the Mount of Olives (the region to be so much a part of his subsequent life), and Joseph pointed out to him that the Holy City lay just beyond this ridge, and the lad’s heart beat fast with joyous anticipation of soon beholding the city and house of his heavenly Father. 124:6.9 On the eastern slopes of Olivet they paused for rest in the borders of a little village called Bethany. The hospitable villagers poured forth to minister to the pilgrims, and it happened that Joseph and his family had stopped near the house of one Simon, who had three children about the same age as Jesus— Mary, Martha, and Lazarus. They invited the Nazareth family in for refreshment, and a lifelong friendship sprang up between the two families. Many times afterward, in his eventful life, Jesus stopped in this home. 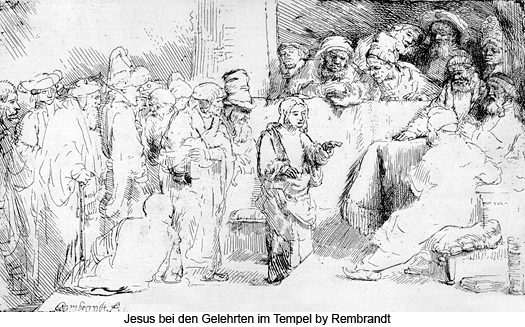 124:6.14 Jesus was profoundly impressed by the temple and all the associated services and other activities. For the first time since he was four years old, he was too much preoccupied with his own meditations to ask many questions. He did, however, ask his father several embarrassing questions (as he had on previous occasions) as to why the heavenly Father required the slaughter of so many innocent and helpless animals. And his father well knew from the expression on the lad’s face that his answers and attempts at explanation were unsatisfactory to his deep-thinking and keen-reasoning son. 124:6.18 Thus ends the career of the Nazareth lad, and begins the narrative of that adolescent youth— the increasingly self-conscious divine human—who now begins the contemplation of his world career as he strives to integrate his expanding life purpose with the desires of his parents and his obligations to his family and the society of his day and age.